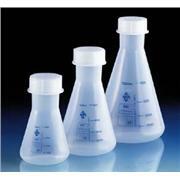 For user convenience, PYREX Erlenmeyer flasks are graduated to show approximate capacity. 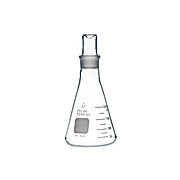 The 25- 50- and 125 mL flasks are satisfactory for use as a weighing bottle. 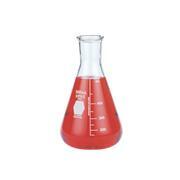 Erlenmeyer flasks come with a PYREX Standard Taper stopper. 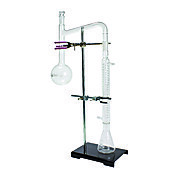 Wide mouth, with heavy-duty, tooled top finish and scale to indicate approximate volumes ASTM Specification E 1404 Type I Class 2 The 125 mL flask takes No. 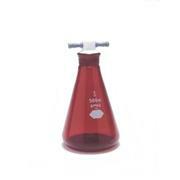 6 rubber stopper; 250 mL flask, No. 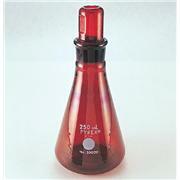 8; 500 mL flask, No. 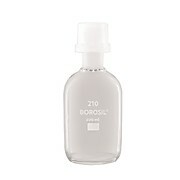 10; 1,000 mL flask, No. 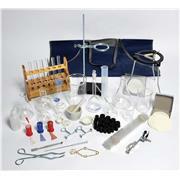 11; 2,000 mL flask, No. 13. 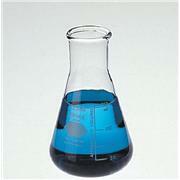 Polymethylpentene (PMP) and polypropylene (PP) Erlenmeyer flasks are an excellent break-resistant alternative to glass. Screened on graduations of approximate volumes. Compatible with standard taper joint stoppers. Supplied with matching PP screw caps. 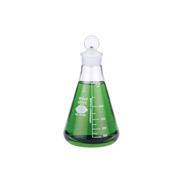 Erlenmeyer flask with included stopper top. No graduations.